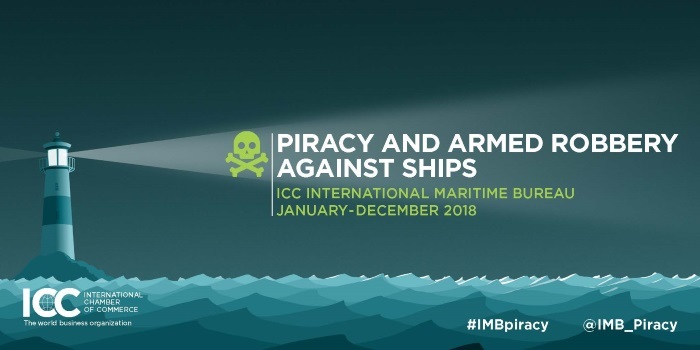 Piracy increased on the world’s seas in 2018, with a marked rise in attacks against ships and crews around West Africa, the International Chamber of Commerce’s International Maritime Bureau’s (IMB) latest annual piracy report reveals. The Gulf of Guinea remains increasingly dangerous for seafarers. 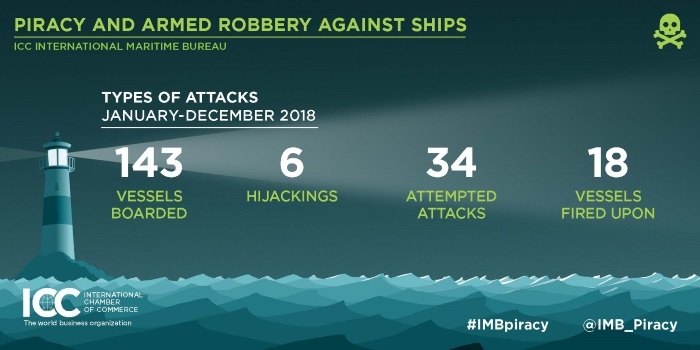 Reports of attacks in waters between the Ivory Coast and the Democratic Republic of Congo more than doubled in 2018, accounting for all six hijackings worldwide, 13 of the 18 ships fired upon, 130 of the 141 hostages taken globally, and 78 of 83 seafarers kidnapped for ransom. In the last three months of 2018, 41 kidnappings were recorded in waters off Nigeria alone. On 27 October 2018, 11 crew were kidnapped from a container vessel 70 nautical miles off Bonny Island, Nigeria. Two days later, Nigerian pirates in a speedboat hijacked a tanker underway 100 nautical miles off Point Noire, Congo. Eight of the 18 crew were kidnapped. 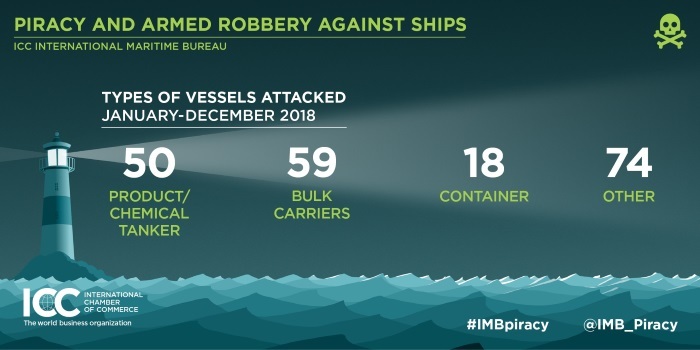 These are just two recent examples of how armed criminals are reaching further out to sea and targeting a wider variety of ships: bulk carriers, container vessels and general cargo vessels in addition to local attacks on tankers, oil industry support vessels and fishing vessels. Although no ships were hijacked in the region, pirates fired upon a suezmax tanker in the Gulf of Aden, as well as a product tanker and a capesize bulk carrier more than three hundred miles from the Somali coastline. IMB urges masters to continue to maintain high levels of vigilance when transiting these waters and to follow the latest BMP recommendations. This also highlights the requirement for the continued presence of the European Union and international navies around the Horn of Africa. Patrols by the Indonesia Marine Police have seen the number of incidents drop for the third successive year. The majority of the 36 Indonesian reports were low level opportunistic thefts. Six crew however were taken hostage and threatened, indicating the need to be vigilant. Ten incidents have been reported from the Philippine islands – down from 22 in 2017. Batangas anchorage accounts for five of these. In one attack, suspected militants fired upon a general cargo ship. The prompt action of the crew and the Philippine Coast Guard ensured the vessel’s safety, although a crewmember was injured by gunfire. The alerts broadcast by the PRC on behalf of the Philippine authorities provide valuable information to Masters and Chief Security Officers (CSO), helping deter militant attacks. 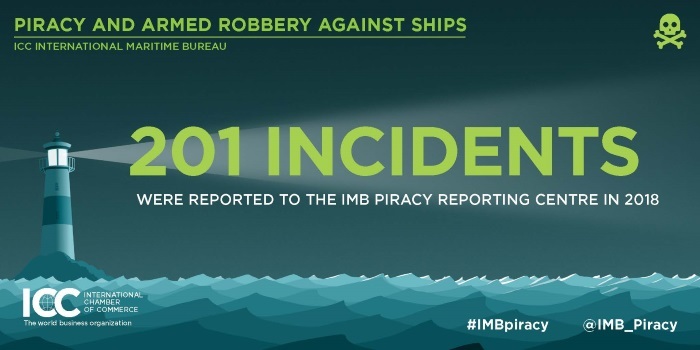 Since 1991, IMB’s 24-hour manned Piracy Reporting Centre has provided the maritime industry, governments and response agencies with timely and transparent data on piracy and armed robbery incidents – received directly from the Master of the vessel or its owners. 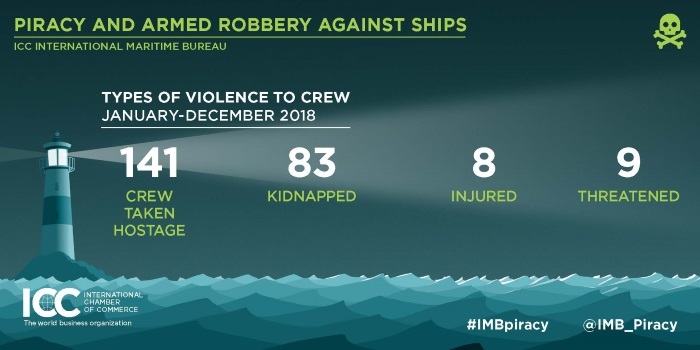 The IMB PRC’s prompt forwarding of reports and liaison with response agencies, its broadcasts to shipping via Inmarsat Safety Net Services and email alerts to CSOs, all provided free of charge, has helped the response against piracy and armed robbery and the security of seafarers, globally. 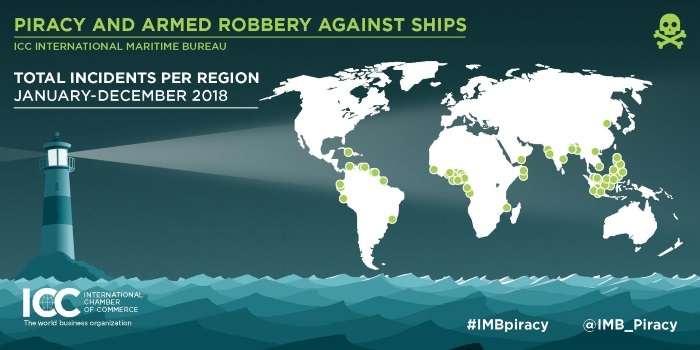 IMB continues to urge shipmasters and owners and other maritime interests to report all actual, attempted and suspected piracy and armed robbery incidents to the IMB PRC. This first step in the response chain is vital to ensuring that adequate resources are allocated by authorities to tackle this crime. As an independent, non-commercial, and apolitical organization, IMB provides transparent statistics, which acts as a catalyst to achieve this goal.